Spencer Seabrooke broke the world record for the longest free solo slackline last week, shattering the previous record by 7 meters. Check our story on slacklining in Squamish, BC, with Seabrooke and Allen Stevens, from the Summer issue of Mountain Life Coast Mountains. From easy-going slackers hanging out in a grassy park on a sunny day to the diehards balancing their way between alpine spires, slacklining is tiptoeing along the edge of mainstream culture. Modern slacklining (walking on nylon webbing as opposed to circus tightrope), got its start in Yosemite in the late-’80s and continues to gain popularity around the world. In Vancouver, slacklines are no longer a bizarre sight for passersby and new highlines crop up throughout the Sea to Sky each year. Squamish resident, Allen “Hevy Duty” Stevens was a Camp Four Yosemite dirtbag in the days when slacklining was getting off the ground. He moved to Squamish in 2002 and brought his psych for the sport with him. Hevy saw the potential in slacklining and became a champion of the local scene by starting Hevyfest: an annual slackline and music gathering. What initially began as a bunch of his buddies on the beach with brown bags fooling around on the lines has become a regular part of Squamish summer culture. “I like to see all the people and just watch it grow,” he says. At the 2014 Hevyfest, there were over 200 waivers signed, a DJ and 15-some slacklines—including a waterline out into Howe Sound. Carl Mars, North Gully, Squamish. Bill Hawley photo. Spencer Seabrooke is Canada’s first slackline superstar. Initially drawn to slacklining after watching the Real Rock Film Tour in May 2012, Seabrooke recently walked a personal best—a 70-metre line—on Christmas Eve 2014. 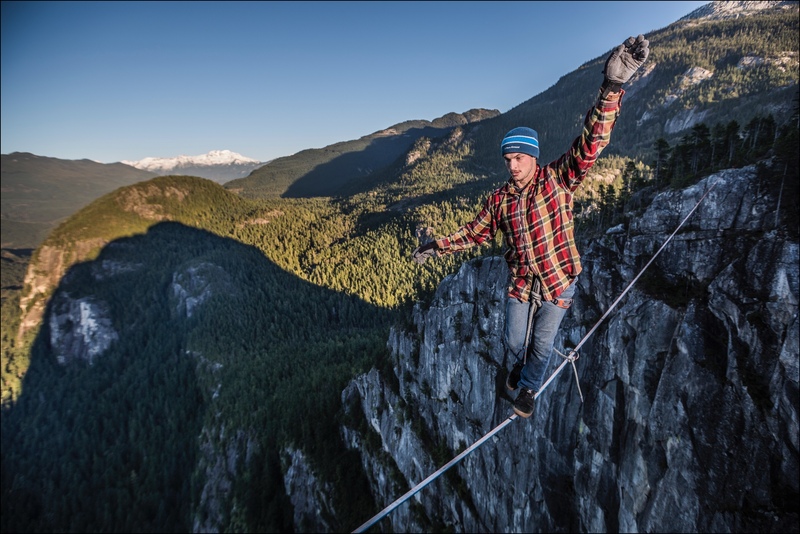 As public understanding of slacklining grows, Squamish continues to be a focal point. Down at Nexen Beach, Hevy is planning to run Hevyfest again. “It is the one and only slackline park in North America where lines are always set up with free use to the public,” he says, adding that he’s working with the District of Squamish to get the space officially recognized for this purpose. Seabrooke over the water at Nexen Beach. Jimmy Martinello photo. Downtown, signs and posts have been erected for a second slackline area across from Pavillion Park, and in 2014, Spencer and the Slacklife BC crew put up new highlines and waterlines throughout the Sea to Sky region including Brohm Lake, Lighthouse Park, The Opal Wall and North Gullies on the Chief, Seymour Canyon and Sky Pilot Mountain. Walking progressively longer lines, Spencer continues working towards a 100-metre goal as his passion for slacklining grows with each step.